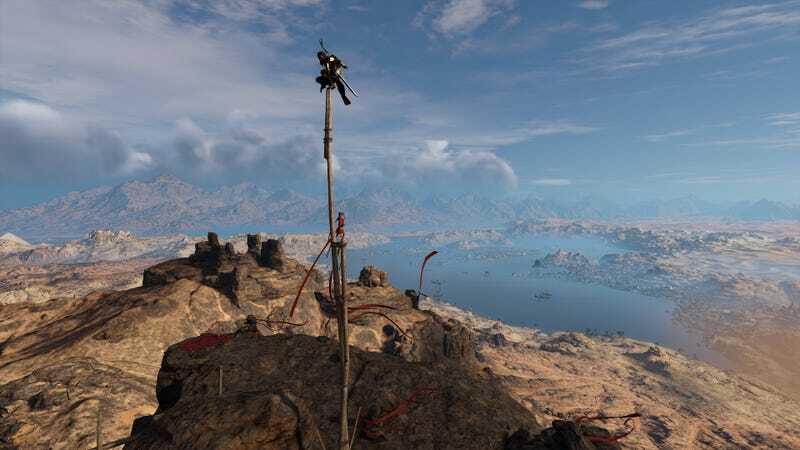 A very high vantage spot in Assassin’s Creed Origins, a game that was in development while at least three other Assassin’s Creeds were also being built. There has been one major new Assassin’s Creed game every year since 2007, except for the two years they skipped and the one year when they made two. It’s never been a secret that Ubisoft rotates teams, but it’s never been as clear how they do it until a talk given by the head of the franchise at the Game Developers Conference in San Francisco last month. “It only could be done working with multiple core teams,” Assassin’s Creed franchise head Jean Guesdon said, “I’m not talking about multiple teams collaborating on one game. This was a brand-new thing.” It was new for Ubisoft, of course, though Activision was doing something similar with Call of Duty. He then showed a chart that marks the division of major labor across the series’ past decade. Chart showing the main teams behind the major Assassin’s Creed games. Note that Black Flag was started after Unity but released before it. Surprisingly, Guesdon’s chart shows that development on 2014’s Assassin’s Creed Unity, the first game in the series for the PS4/Xbox One generation of consoles, actually began before development on 2013’s Assassin’s Creed IV: Black Flag, a game that Guesdon was creative director on. Guesdon’s chart simplifies things, obviously. The lead visionary behind the first three Assassin’s Creed games, Patrice Désilets, split from Ubisoft during the development of Assassin’s Creed Brotherhood, and so the line leading from Brotherhood to Unity is not quite as smooth as it seems. The green and gray circles for the Ubisoft Quebec City team represent expansions that studio made for ACIII and Black Flag, the latter being the acclaimed Freedom Cry that was later released as a standalone adventure. Quebec City went on to make the distinct, high-quality Assassin’s Creed Syndicate in very little time. Assassin’s Creed games, like most Ubisoft mega-games, are made by a United Nations’ Security Council worth of Ubisoft studios, many of them in support roles. Ubisoft Singapore, for example, did the dramatic, linear hidden location missions in early AC games and went on to handle a lot of the naval action in Black Flag. Much of that studio is now making the non-AC Ubisoft pirate game Skull & Bones. Guesdon said that Ubisoft has shifted from having collaborative studios to “co-development.” With the former approach, he said it was always possible to cut the work the collaborative studio was doing. With co-development, he said, the contributions have become more integral. To demonstrate how that was done for Assassin’s Creed Origins, he showed the game’s vast world map, with red and blue areas marked for regions that were designed by Ubisoft Sofia (in Blugaria) and Ubisoft Singapore, respectively. Ubisoft Montreal led development of AC Origins. Two other studios handled several features like pyramids and naval experiences as well as the design and quests of two huge sections of the game’s map. As someone who is just now playing through the northwest part of Origins’ map, I can confirm that that area does indeed feel like it was made by distinct creative hands. Quests in that section, for example, are more intricately interwoven compared to quests in other parts of the game. It’s no surprise that Ubi Sofia would be able to do high-quality work in their sector of Origins. After all, as Guesdon’s chart reminded everyone, they once led development of an AC game themselves, 2014’s Assassin’s Creed Rogue. Now, of course, the guessing game is about who will make the next Assassin’s Creed. It sure look like it’s Quebec City’s turn, unless whatever remains of that first Montreal team is primed for another go ‘round. Guesdon’s full hour-long presentation, which covers a decade of Assassin’s Creed game development philosophy and includes some interesting behind-the-scenes looks at multiple games in the franchise, can be viewed at the Game Developer’s Conference video vault site..